Duryodhan in Mahabharata: Find all detail about mahabharata Duryodhan! Duryodhan knows for his ambitions .he is eldest of the kauravas and famous for an excellent fighter.the basic meaning of Duryodhan is hard to conquer .Duryodhan was very vocal about his feelings and he liked his friends and family but he was ruthless to his enemies. Actor Arpit Ranka has been finalized to play the role of Duryodhan (Duryodhan in Mahabharat) in Star plus Mahabharata.Arpit is model turned to indian actor.He won the many Best Body at Gladrags few year ago.Arpit also done role in Tamil and Telegu.finally Arpit has got offer from Swasik Production's mythological show Mahabharat on Star plus as Duryodhan in mahabharat. 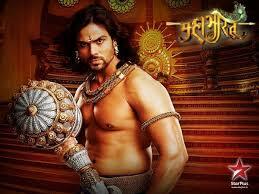 We are representing the information about Duryodhan's role and Character in mahabharat Characters.